4) Two selectable failsafe setting options. 1) Ascertain that the transmitter is in the PPM mode. Turn the transmitter off. 2) Turn on the transmitter while holding the F/S button on the transmitter module. Release the button. The RED LED on the transmitter module will flash, indicating the transmitter is ready to bind to the receiver. 3) Connect the provided binding cable to corresponding channels of VD5M (see 1.1 Compatibility chart for details), and connect battery to the receiver. LED on the receiver will flash, indicating the binding process is completed. Turn off both the transmitter and receiver, and disconnect the binding cable from VD5M. 4) Turn on the transmitter and connect the battery to the receiver. The RED LED on the receiver will indicate the receiver is receiving commands from the transmitter. The receiver/transmitter module binding will not have to be repeated, unless one of the two is replaced. 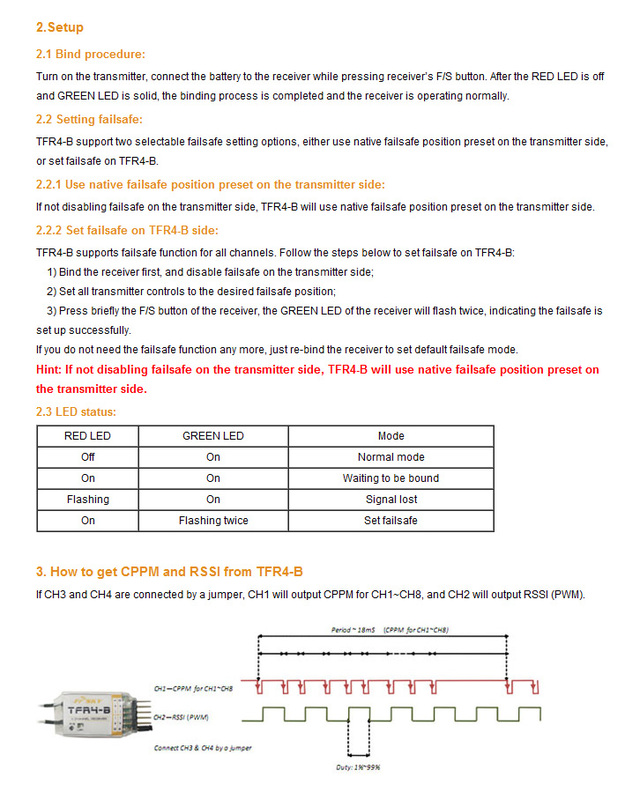 Note: Make sure corresponding channels are connected by provided binding cable when working with the transmitter module.